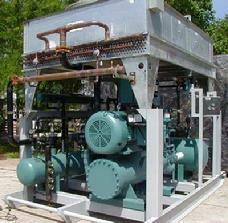 compressors are among the most widely installed types of industrial equipment. Subject to frequent starts and prolonged operation under partial-load conditions, they are also among the most energy-intensive applications for industrial motor power. This means they are great candidates for synchronous permanent magnet motors. Together with a variable frequency drive, an Argo|TEMA motor delivers exactly the power required by your compressor over its entire load range. And the elimination of wire wound rotors mean they run cooler, start and stop faster, and offer precise control by plant fieldbus systems. 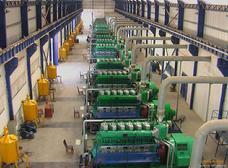 Industrial pumps and blowers need motors with a wide range of speed, power and control. They are used in nearly every industrial setting, often under harsh conditions. Argo|TEMA permanent magnet motors provide low-cost, long-life solutions within even the most extreme pump and blower operating parameters. Fixed, mobile, or marine, light duty or over 1,000HP, Argo|TEMA motors fit your pump applications without compromise. Let our engineering team work with yours to insure that you and your users get optimum durability and efficiency that starts saving them money from day one. Gensets provide power in stationary, mobile, and marine applications where utility power is either inadequate or unavailable. Equally critical for remote jungle mining operations or emergency power in medical facilities, gensets are valued for their fail-safe reliability. Exceed your genset operating parameters with Argo|Tema synchronous PM generators. Our specs speak for themselves. Cool-running, reliably embedded permanent magnet rotors deliver high-90's efficiency along with extreme overload tolerance and long MTBF. Whether you choose our LPMR, LPMG, or SPM lines, Argo|TEMA sets a new standard for genset reliability. Equipment now on the drawing boards for machining castings, forgings, and fabricated assemblies is pushing the bounds of physics in cutting control, precision, and power. The unique characteristics of synchronous permanent magnet motors are placing them at the top of metal forming equipment manufacturers' lists. You need precise electronic start/stop control, full torque across the entire RPM range (reducing dependence on gear boxes), and vibration-free operation. Argo|TEMA offers standard frame, custom, or open frame motors and components to precisely fit OEM specifications. Contact us today for a complete response to your most demanding metalworking application requirements. Mining is undergoing revolutionary change. ROV (remotely operated vehicle) technology is minimizing human hazards, maximizing efficiency, and lowering cost especially in underground operations. The loader shown is battery-powered, remotely operated, and capable of hours of work on a single charge. Argo|TEMA motors are being specified because of their light weight, constant torque over the full range of RPM, and precise control. These vehicles are designed for environments most prone to human injury yet requiring less protection and ventilation than either humans or fossil-fuel powered units. The idea came from unmanned minesweepers now in use around the globe. Move your mining equipment into the 21st century with electric power from Argo|TEMA. 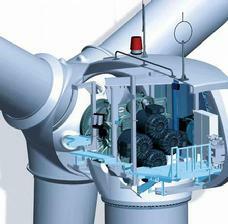 As shown in this CAD rendering, the latest generations of wind turbines drive multiple generators with a single blade set and gearbox. This enables higher total generating capacity, system redundancy, reduced capacity instead of outage in the event of generator failure, and smaller, lighter generators facilitating installation, removal, and replacement. The same principles apply to wind turbines of all sizes and capacities, lowering life cycle costs and increasing total power generation. Oil and gas development is among the riskiest and most capital-intensive work ever undertaken. With offshore drilling appproaching three quarters of a million dollars per day, equipment must be powerful, reliable, and precisely controlled. 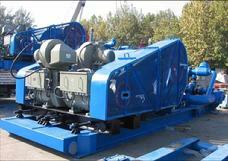 From mud pumps to diesel-electric gensets, powerful electric motors are the prime movers. With full torque from zero to maximum RPM, synchronous permanent magnet motors are making it possible to reduce or eliminate gear boxes, minimize fuel consumption, maximize bearing life, and increase rig efficiency. How? No rotor windings, no commutators, embedded rotor magnets instead of surface-mount, low rotor inertia for prolonged bearing life and fast, precise start/stop control, high starting torque, and high fault tolerance. See the "Products" section of this website for more detail. Energy efficiency, long service life, and safe, quiet operation top the list of requirements in today's industrial and commercial refrigeration design specs. Argo|TEMA PM motors are by design the top choice for industrial refrigeration applications. 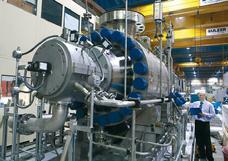 Let our engineering team work with yours to meet and exceed your most challenging requirements.